Windmills first appeared in Western Europe towards the close of the 12th century and may have been introduced by returning Crusaders. 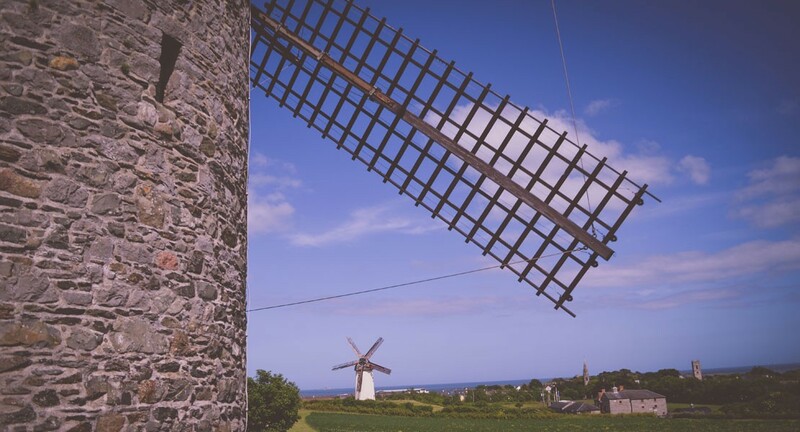 The earliest known Irish windmill is through to have been built in County Wexford by 1284 and the older of the two Skerries windmills is first mentioned in the mid 16th century. In 1801, Joseph Archer’s Statistical Survey of County Dublin listed windmills at Rush, Skerries, Garristown, Donabate, Knock, Stephenstown, Nutstown, and Ballymadun, all in the barony of Balrothery and at Feltrim, Kilsallaghan and Balheary in the barony of Nethercross. 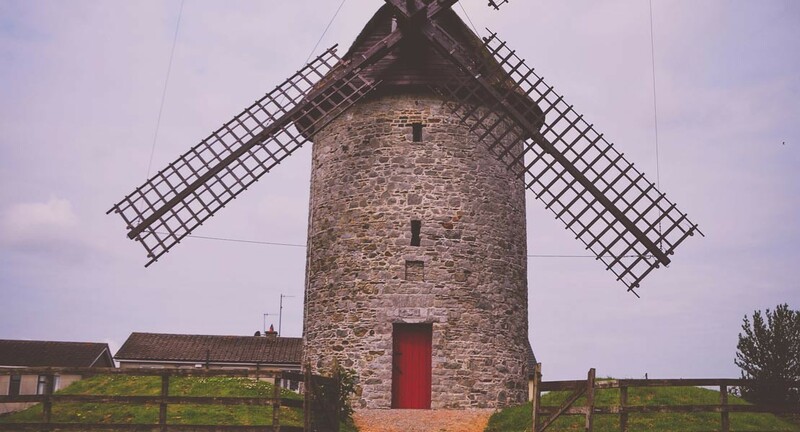 Skerries Mills stood out from its neighbors in having both wind mill water power available. 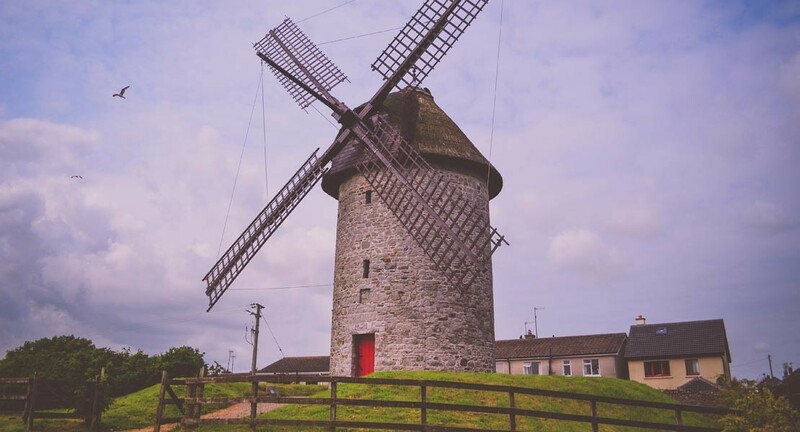 The Skerries Mills are both “tower mills” in which the cap alone, and not the whole structure is turned to the wind. The small four-sail cylindrical mill is one of the earliest forms of windmill and uses simple canvas sails. The thatched wooden cap rest on hardwood bearings and is luffed or turned to the wind from inside the mill by hand-winch. The sails are mounted on a wooden beam known as a wind shaft, which rest on a stone bearing in the roof space. When the wind blows, and the sails turn, the break wheel mounted on the wind shaft engages with a lantern pinion – an early type of gear wheel – located at top of the central vertical shaft. Power is transmitted downwards via the central shaft to a single pair of grinding stones. Grain is carried manually to the top of the mill. The Small Windmill is build on the site of a prehistoric fort, the highest point in the town. The mill is 40 feet (c.12.2m) high with diameter of sail of 53 feet 4 inches (c. 16m). There is a difference in height of 10 feet (c. 3m) between the ground levels of the two windmills.